My wife and I went to Saltwater Grille with our immediate familes after we got married but hadn’t been there since, so we made reservations to the waterfront location with the hopes that it was as good as we remembered even though there was no special event to celebrate. That last visit seemed like eons ago, so for all we knew, it could have been a totally different experience. Our return came on the very last day of Restaurant Week and gave us a chance to try a prix fixe meal at a reduced price. Due to poor planning, however, we had a big lunch and didn’t arrive as hungry as we might have liked. Nonetheless, we made the short trip there to see what they were serving up in the present day. A minute or two after we walked in the door, we were seated in a location that, had the sun still been out, would have given us spectacular water views. Unfortunately, it was dark, but I was still happy knowing the water was near. A waiter stopped by to deliver bread, let us know that we could order from either menu, and said he’d be back momentarily to get our drink orders. He also told us that they were out of one item from both menus and, to my dismay, the restaurant week item was one I wanted to order. I immediately placed that menu aside and focused on the drink and everyday food menus. I also snagged a piece of bread which was soft, chewy, and had a taste of fennel and other flavors. When the waiter came back to our table, we had our drink choices ready to go. First, my wife ordered a Moshua Sauvignon Blanc. 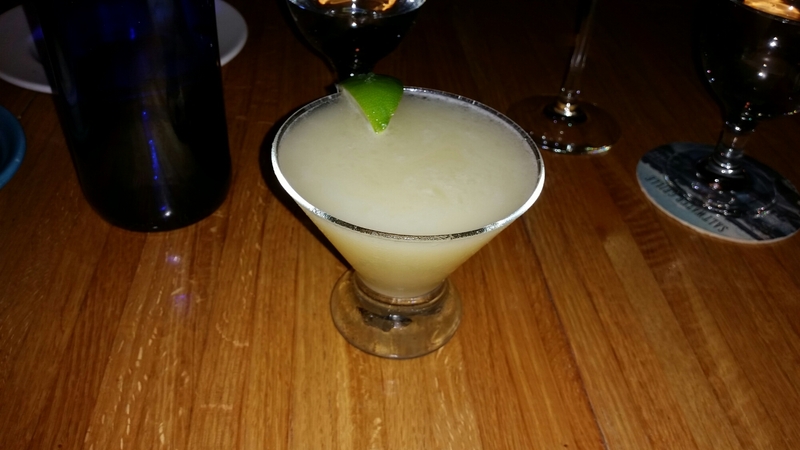 I was feeling a bit tropical in anticipation of spring weather so I decided to try the Lime in the Coconut – Captain Morgan White Rum, pineapple juice, coconut cream, lime. It was a little outside my normal realm of drink orders, but I was feeling the unusually warm weather we were already having in late winter and thought that drink might speed up the sprint to sunshine and flowers even more. The menu featured an assortment of starters, pizzettas, entrees, and seafood plates. Because I wasn’t too hungry, I considered ordering only an entree or a small starter and a pizza. Seafood entrees looked appealing; Penne Carbonara or Broiled Haddock sounded good. Then I reviewed the pizza options; The Clam Bake, Loring Lobster, and Steak and Cheese all made me feel positive vibes. Before I made a final decision, I looked to see if there were any starters in which I was interested. I hadn’t had chowder in quite a while and saw the Haddock and Clam chowder at the top of the menu. I decided to go with that. To accompany it, I went with the Loring Lobster Pizzetta – Maine lobster, house marinara, fresh mozzarella, grilled corn salsa, basil, asiago. 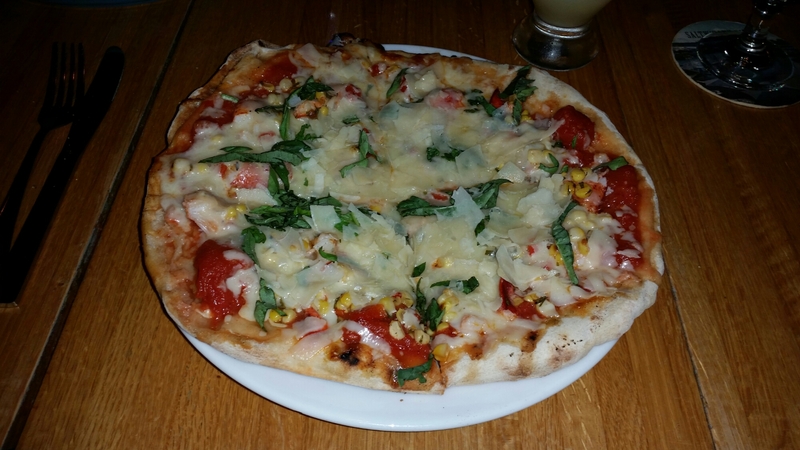 Mrs. Portlandeater went with the “Marguarita” – house marinara, grape tomatoes, fresh mozzarella, fresh basil, parmesan. Upon the waiters return we got our drinks and ordered our meals. I tried my cocktail. What a magical creation! It wasn’t the first time I had that drink or similar ones at other locales, but it was undoubtedly one of the best. Each individual flavor stood out and the combination of them all was great. It wasn’t overly sweet, but instead blended the fruit sugars and citrus together very well. It was a refreshing cocktail that certainly set aside my remaining end-of-winter blues. My wife sipped her wine and we awaited our foodstuffs. Before long, I got my cup of chowder and was excited to try it. After accepting some fresh, cracked pepper – are there people who eat chowder without pepper? – I dug into the creamy, flour-thickened-soup. It was hearty with plenty of the clam and haddock. The flavor was great and seafood-y, but I immediately recognized a bacon blast which I was not used to. It was a nice twist, but unexpected. I continued to spoon my way through the cup until the I reached the bottom, running into sizable hunks of haddock and bacon along the way. With chowda finished, I had a chance to take in more of my excellent drink. About a sip and a half into it, the pizzas landed on our table. I immediately saw that mine was doused in large amounts of cheese. There were no shortage of other toppings either as they were liberally spread throughout the doughy saucer. The only issue I had was transferring a slice to my plate without all of the top falling off. I was only somewhat successful, but success is what you want it to be and I was determined to achieve full pizzariffic gratification. I quickly replaced my fallen pie pieces before placing some of it into my pizzetta hole. It took about three bites of pie to get beyond the crust since I was eating it in reverse by starting with the outside. I got into the heat of battle with a piece that contained all the good stuff. The slightly acidic marinara, sweet corn salsa, and mildly pungent basil accompanied the loads of cheese and a hunk of lobster. It was an interesting flavor combination to say the least, but I appreciated the uniqueness of it. The pizza had quite a bit of lobster, but it was somewhat minimized by all the other parts. For me, it wasn’t a big deal; if I wanted more pronounced lobster, I would have simply ordered their lobster dinner. I was happy with it and noted that the corn appeared to have been manually scraped off a cob. My wife seemed to be enjoying her pizza, but I noticed her slowing down after only a single slice. Despite not showing up to Saltwater Grille as hungry as usual, I managed to finish all but one slice of my pizza. She couldn’t match that and took about half of hers home. We were tapping out. Unfortunately, I didn’t sample quite as much as I would have liked to, but what I did eat was very good. 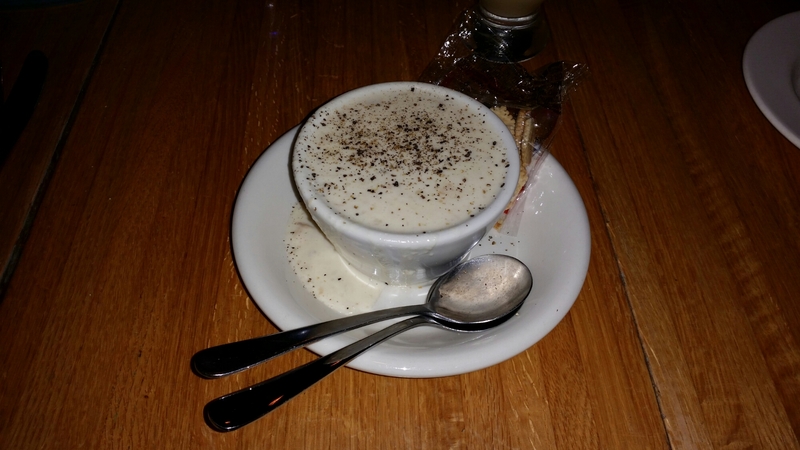 The fully-topped pizza and bacon-touched chowder were fun takes on common items and my drink was truly superb. Our modest ordering only set us back about 60 bucks before tax and tip, so the meal didn’t put a major dent in my wallet either. Next time I’ll be sure to save room for more and I’ll definitely be there when it’s warm enough to sit on the deck and watch the ripples in the water. Go to Saltwater Grille to enjoy the food and drinks, to take in the water views, and even for a slight change of scenery if you always go out in Portland. But do go, because there are plenty of reasons why I think they’ll be able to put some wind in your sails. This entry was posted in Portland, ME food on March 17, 2016 by peterpeterportlandeater.